Want to verify Facebook page? But do not know how ? Well, You are just landed on right blog where You are gonna find official way which you can use to get your Facebook page verified. I have published this article in three year ago when there was no official way to get a verified Facebook account. Those days, only celebrities could verify page on Facebook. But Facebook has updated it’s instruction which says that anyone with media influence can verify Facebook account. Now you can also get a blue check on Facebook. Recently I have seen my friends who are getting verified account on Facebook. Then I started researching about what actually that you need to do to verify Facebook account. While researching about same, I found that anyone can get a verified on Facebook. In fact It made it easy for you to verify your Facebook account. What you need to have for Facebook page verification are press release and media mentioned on popular website like Huntington Post and New York Times. I am gonna share each and everything that can help you verifying Facebook account. 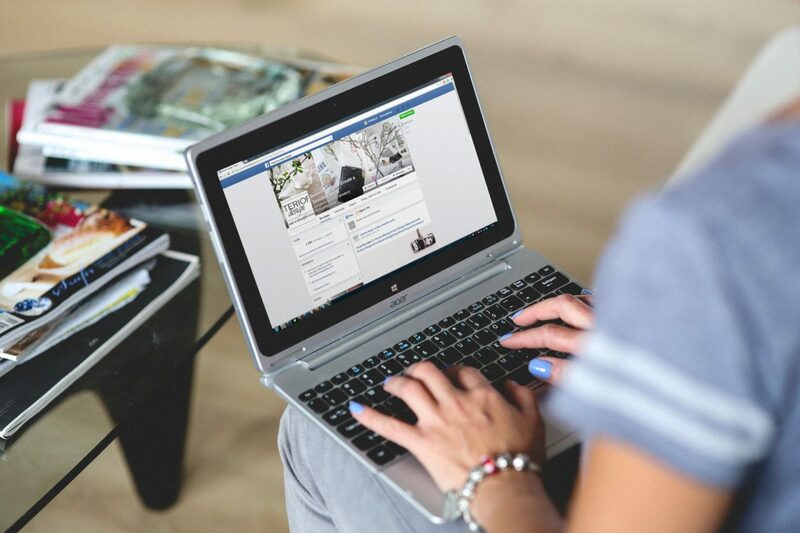 Let’s directly head to how to get your page verified on Facebook. How to get your Facebook page or profile verified ? Facebook has different categories for different business and public figure. You may know that celebrities and journalist can verify Facebook page without any hassle as they have mentioned in media thousands of time. If you are Government official then you can get verified Facebook page in just 5 minutes. Just like this, there are long list of categories under which you can get a Facebook page verified. Everyone can not be like celebrities and journalist but you can still get verified on Facebook. I am not talking more about any category as you are here to verify Facebook account and that is what you will be knowing before leaving. 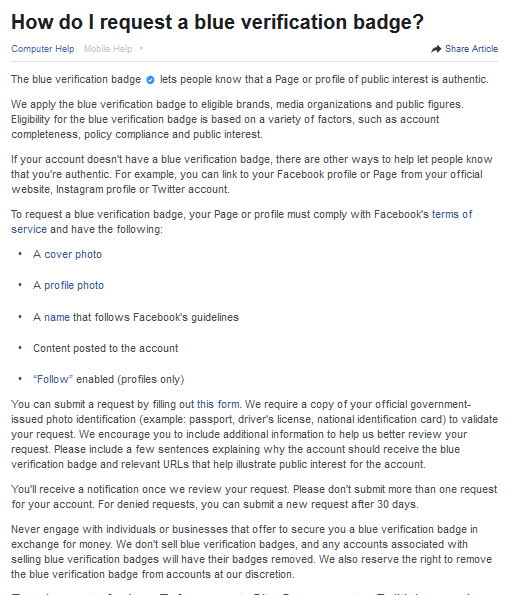 But, You will have to understand that if you do not have any public presence on Facebook then it will be difficult for you to get your Facebook account verified. If you are author of book which is published and also has name in several newspaper then you are good to go. If you are influencer who has great public presence on Facebook then you can also verify Facebook account. How to Get Your Facebook Page Verified With Blue Check? ⦁ Update your basic information on page and profile. ⦁ Add your address and hours of business. ⦁ Add your email address and website. ⦁ Link your website and official account with your page. Information you provide in your profile or account should be accurate and match document which you upload along with verification form. Facebook has opened window for everyone whoever want to verify Facebook page or account by making verification form available for everyone. Earlier, You could not find Facebook verification form but now as it’s accessible by anyone. You can take advantage of that and submit your form with supporting document and additional information telling why your account should be verified. 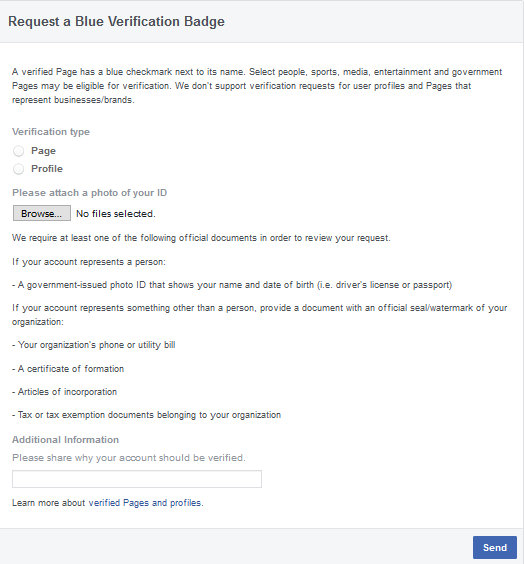 Okay, Now I am telling you criteria which you consider or understand whether or not you are eligible for verifying Facebook page and account. For Facebook account, You should have public presence that may include engagement on your post which you published in last 30 days. For Facebook business page, Your business should have mentioned in media and news websites link of which you can submit while filling up verification form. That’s all you should know about verification process. Where To Find Facebook Verification Form? I have shared link of verification form for both account and page which you can open yourself and submit it with supporting documents and addition information. You can use same form for both page and profile but list of document will stay same. I can write more on same but that will just waste your time. So, I am leaving you with form that is easy to understand. If You need information on same then let me know below in comment. I will reply as soon as possible. I am professional blogger, Internet marketer and affiliate marketer. I mostly write about Blogging, Social Media Marketing, WordPress, Web Hosting and SEO. ← A2 Hosting Review: Is it Better than Bluehost & Hostgator? No , I have seen Verified Facebook Page even with 500 likes.I have recently Verified my Facebook Page with 200 likes. Yes Jp, Likes does not matter. Facebook verify page and profile when consider it authority. how can i verify my page, bt in india they cant accpeting new request, what to do? Link is not working .change it and informe me. Yes Arpit Its not working for India but You can try after some time with US proxy.I’ll look at more ways to verify page. I run an official fan page of a legendary actor, Basanta Choudhury. I have tried using several on-line proxy web-sites, but not satisfied.I do not understand, whether I did it in right way or not. I humbly request you to please help me in dealing with the proxy. (Distance Grand-son of Basanta Choudhury). Hi, It did not work for me either. Is there any other way through which I can verify my Facebook page which has got 15k likes? Facebook has blocked this link in India.So , Its not working now.Whenever I got any way to verify facebook page I update here. Thanks for contacting us about verifying your Facebook account. We’ve reviewed your account closely; however, we’re not able to verify your account right now. Verification is based on a number of factors and is different from policies on other social platforms. This doesn’t limit your ability to grow and develop your account and followers. You may resubmit your account for reconsideration in 30 days. Our team is more than happy to help you further establish your authentic presence by removing imposter accounts. Please continue reporting imposter accounts to us, so your fans can easily find your authentic Facebook presence: https://www.facebook.com/help/contact/275838595859624. Its common when Facebook could not recognize people who are managing page by document he/she submitted then their team send message like you got one. I suggest you to try to verify facebook page with another ID. Check out this page https://www.facebook.com/help/159096464162185 to know why you didn’t get your facebook page verify. Drop me a message on Facebook once your page is verified and if possible share link to your official Facebook page with me . Another ID? as in create new account using US proxy? that is : what is the criteria ? but still my request got rejected? Should those ID be US based?? Age of page does not matter for verification. I think that if your facebook page is getting huge response from your audience then verification option appears automatically and let your verify your facebook page. If you’ve applied using US proxy then your ID should be US based. Right Now only grey badge are available in India as facebook blocked blue badge verification page. I was confused about the process, I submitted successfully my application for verify my page and got my page verified today. No, Even Page with 1000 likes are getting verified by Facebook. So you don’t need to worry about like. Make sure that you follow facebook guideline that’s it. Okay I will ping you soon. can you please help me verify a page of an political influencer? You should contact facebook headquarter for same if page is related to any political influencer. I need urge t help for Facebook page verification. Please please sir help me. Please please please please please sir help me. Team will get back to you. What sort of ID proof we need to submit? we have a website and we do movie promotion in our page, our current page likes is 150k and it is growing rapidly. For these types of the page what ID proof I need to submit to them?my govt id will be ok? or anything else????? You must have any Government ID proof to get page verified. my page http://www.facebook.com/gogiclan is an official call of duty clan but i cant get it verified. what to do? I sure could use some help. I’ve tried all the above and was not successful. Could you please help me also? Please, help me for facebook page verification. Hello! Your link to verification is no longer an option given by Facebook. I have no idea why. It is no longer available, anywhere, including the USA. I’m a musician and I wanted to verify my page, but unfortunately I’m unable to. Any update to the reason why Facebook has blocked this feature? Only grey verification for businesses is allowed for submission now. You’re right. Verification link is no longer available to everyone. In most cases, it appear automatically and then we need to submit/upload asked documents to get page verified. great blog and thanks for being able to provide very quick answers. Am one of the Admins to a FB page, created in India. FB page is created under the category of “Public Figure”, which is very true, has over 27k+ likes. With recent changes for having a Blue Badge verification being automatic from FB perspective and the old links not working to upload verification document. I am looking for your ideas/tips on how to make FB automatically give us Verification link to upload documents.. This is under “Public Figure” category.. Please Send your page link to our facebook page so that we can check it 🙂 and give you best advice. you mean the link to be posted on your FB page wall is it ? Hi Ravinder, any idea how long fb would take to enable “verify page” , also sent you a inbox message.. like to know if there is way to expedite the same.. It depends on Facebook page activity and fans engagement on posts. Does it is possible to verify facebook profile or account. I think it has been blocked nowdays. You are right that its blocked but for some people. Facebook is enabling verification link for those whom it consider authority page. Bro I have a one more question regarding page verification. What is the updated link of page verification? I had tried so much using differen us vpn but it still say page not found. And what is your facebook page and account link? Hey Mukti, Facebook is enabling ” Verify Page ” option in General settings of Page for authority pages so what we can do is complete our bio detail and wait for facebook to enable link for us. Ravinder Dande sir, can u help me please?? my have not eligible for verification..rigion or mention not availble right now..
but i used us proxy but dont working.. and also i cannot do verify page.. so i request u can u help me and to do verify my page?? and my page all about info complete and full fill up done and match with my National id card, birth certificated many more!! so please verify my id/page with blue badge!! from ur country or another way…. my country is not avaible for verification..my country name bangladesh.. and us proxy donot work…and u can give me also correct us proxy! Contact us on facebook page 😀 I will try. brother i knoked ur page and u dont reply!! pls cheq ur fb page!!! I would like to contact you for help with this issue. Can you let me know what your facebook page is called? I work at a production label and we are trying to figure out how to verify our artists on facebook. Is that process is working in Bangladesh ? Process to verify facebook page is same for every country. 🙂 Just follow it and get verified page. Is there a method to getting your gray badge to convert to blue? No, You can’t because Gray badge is for small business whereas Blue badge is for authority pages which is verified by their submitted documents.